Due to its design, it has been deemed one of the most unstable, most dangerous vehicles on the road. It is important to understand the dynamics of the 15-passenger van and what makes ita greater risk than most vehicles for accidents. The 15-passenger van has been the subject of many studies over the years. It has beenscrutinized and closely examined for safety issues and its inability to handle certain situations and road conditions. Due to its design, it has been deemed one of the most unstable, most dangerous vehicles on the road. It is important to understand the dynamics of the 15-passenger van and what makes ita greater risk than most vehicles for accidents. Fifteen passenger vans were first developed in the 1970’s as an alternative to buses so that small groups of people could travel together. Rather than using buses to cart around smaller groups, many types of businesses turned to these larger vans for transporting their patrons. For businesses likeday-cares, churches, airports, nursing homes, schools, even the US Army, 15-passenger vans are convenient. However, their convenience was soon questioned when it was realized that they posed serious dangers. Over time, issues with tire performance and propensity to roll over in an accident became a big safety concern. 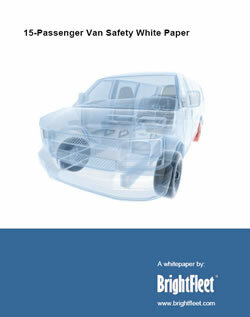 Accidents related to the 15-passenger van are recorded with the National Transportation Safety Board (NTSB). Records show that between 1994 and 2004, the NTSB recorded 1,512 fatalities related to the 15-passenger van. Of those, 642 of the accidents were single-vehicle crashes, 515 of the accidents involved rollovers, and 120 of the deaths occurred in 2004, alone. A National Highway Traffic and Safety Administration (NHTSA) analysis found that between 1997 and 2006, 1,090 people were killed in 15-passenger van crashes. Of those fatalities, 63 percent of deaths occurred in rollover accidents.Fifteen passenger van accidents happen more often than they should. Every year there areaccidents reported involving 15-passenger vans, many of the crashes ending with serious injuries and even fatalities.